THE Labuan Island, situated off the mouth of the Brunei River in the Brunei Bay has an area of thirty square miles (78 square kilometres). It was relatively uninhabited when the British took it, being only occasionally visited by fishermen. It was said to be originally covered with dense forests with some of the trees being valuable as timber but most of them were gone by successive coal companies and the cultivation practice of slash and burn by the Kedayans and other squatters from Borneo. According to W H Treacher in his book ‘British Borneo: Sketches of Brunai, Sarawak, Labuan and North Borneo’ (1891), a few cargoes of timber were also exported by the Chinese to Hongkong from Labuan. There were then expectations that Labuan would mimic Hong Kong in that a freeport island lying next to a rich country would result in it becoming an emporium and collecting station for the various products of Borneo and that of the Sulu Sultanate. However many causes prevented this from happening. This article will not dwell on how and why Labuan was formally annexed by the British but will describe the events during the opening ceremony as described by the Illustrated London News (ILN). It was December 24, 1846 when the British first formally hoisted the Union Jack flag over the island, an event which was witnessed by a number of Bruneians. 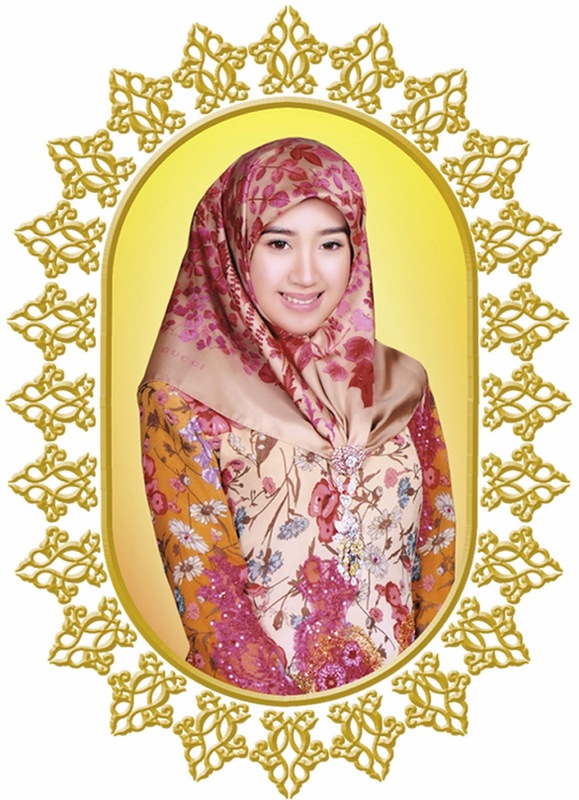 The Brunei delegation was led by Pengiran Bendahara Mumin (who later became Sultan Abdul Mumin). Interestingly, ILN reported his name as Pangeran Mourmea. Sultan Omar ‘Ali Saifuddien did not grace the occasion by pleading that he is prone to sickness. The proceedings on the British side was presided by Captain Mundy of HMS Iris. On April 3, 1947, the ILN reported a new British Possession – the Island of Labuan. The treaty signed by the British and Brunei had among its objectives, firstly to establish long friendship, secondly, the cession of the island was in perpetuity and thirdly, to ensure a mutual understanding for active efforts on both sides towards the suppression of piracy. When the British first took over the island, a number of natives from the Borneo island had expressed their interest to settle on Labuan. However, since there were no instruction from England, the British navy did not allowed this to happen. Among the crew of the British ships of HMS Iris and HMS Wolf, quite a considerable number fell sick. Commaander Gordon of HMS Wolf was said to have died of jungle fever, brought on by over-exertion and the clearing of a large space on Labuan Island which produced miasma resulting from the newly exposed ground. The British navy however said that it was the carelessness of eating native fruits which caused the prevailing sickness rather than any peculiarities of the island. They referred to James Brooke of Sarawak who had sufficiently demonstrated that, with ordinary prudence, Borneo is as healthy as any other tropical region of the East. “The Iris and Wolf dressed ship, Royal salutes were fired and Pangeran Mourmea, the Prime Minister, with all the chief rajahs, nobles and several hundreds of Borneans, attended on shore, and their picturesque proas anchored close to the beach, with flags and banners, had a beautiful effect. “Captain Mundy addressed the assembled natives in a short speech, explanatory of the English and Borneo Governments, which Lieutenent Heath put into Malay, and which seemed to give universal satisfaction; the great majority declaring their anxiety for protection from the ferocious pirates and wishing for peaceful trade. 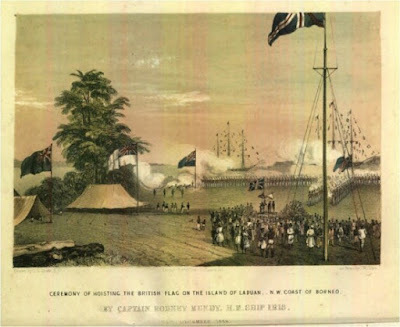 “The British flag was hoisted on the island of Labuan, December, 24, 1846, by Captain Rodney Mundy, of her Majesty’s ship Iris and commanding the squadron on the coast of Borneo. To witness the ceremony many Malay chiefs of distinction had come to the island from Borneo with numerous and showy retinues, and followed by a multitude of the natives, who, quite unconscious of its import, were sanctioning, by their presence, the first step towards, their own emancipation from barbarism. “It was a cheerful, animating sight. Several flags were stuck up; tents were pitched on the clear spaces between the trees; the marines were drawn up in imposing array along the beach, the yards, masts and riggings of the Iris and Wolf were decorated with small flags and steamers; and repeated discharges of musketry and artillery sent forth clouds of white smoke, which were lifted up and dispersed by the breeze. 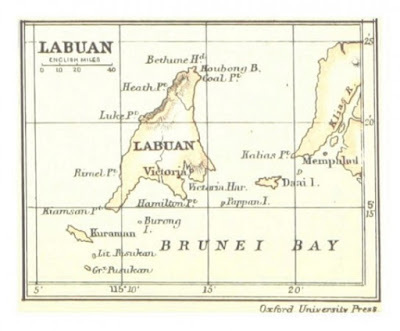 Labuan did not fulfil the dreams of James Brooke. Labuan became part of the Straits Settlement government in 1907, a year after Brunei decided to accept the British Resident System. 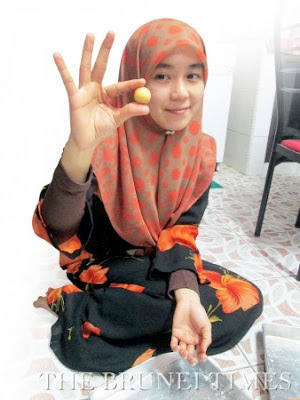 Today, Labuan is best known as an offshore financial centre offering financial and business services as well as a tourist destination for people travelling through Sabah and Brunei.